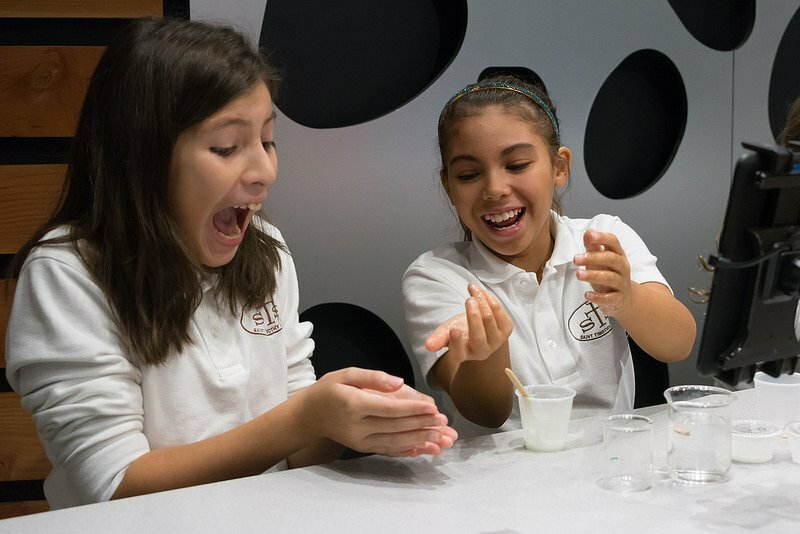 In 2016, the Children’s Science Center?was selected as one of sixteen science centers from across the U.S. to receive a grant from Twin Cities Public Television and the National Science Foundation to implement a program for young Latinas over the course of three years in conjunction with PBS SciGirls. We were confident that we could provide the girls in the program a fun, unique educational experience, but the unintended outcome of creating a supportive and caring community for these young girls, and the overall positive impact on staff and volunteers exceeded our expectations. According to the National Center for Education Statistics 2012 report, Higher Education: Gaps in Access and Persistence Study, only 3.5% of bachelor’s degrees in STEM were earned by Hispanic females in 2010. This systemic underachievement in STEM can be attributed to several issues including: limited awareness, opportunities, and resources; existing perceptions about STEM; and lack of family involvement. Our Latina SciGirls program to begin tackling this important issue. Latina SciGirls is a free program for Hispanic girls in grades 3-5 and their families that takes place twice annually over the course of several weeks at the Children’s Science Center Lab in partnership with local Title I elementary schools in Northern Virginia. Latina SciGirls is a culturally responsive program designed to address barriers that prevent Hispanic girls and their families from engaging in STEM and to promote a positive STEM identity. Critical elements of the program provide young Latinas with opportunities to engage with Latina STEM professionals to foster mentoring relationships and a parent education component to support their daughters’ interest and achievement in STEM. Latina SciGirls program begins with an open house event held at the elementary school. Students, parents, and families meet program staff and the Latina STEM mentors while participating in hands-on STEM activities. Each subsequent weekly session covers a different STEM topic: physical sciences, environmental science, engineering, forensics, biology, and chemistry. The Fiesta de la Familia event celebrates the end of the session with families, girls, program staff and the Latina STEM mentors for a night of hands-on STEM activities. The goals of the program are to increase access for Latinas and their families to positive STEM programming, and promote positive STEM identity development. 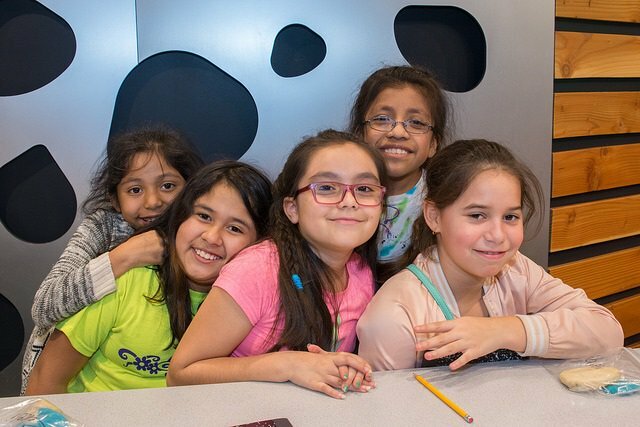 To ensure regular attendance of the Latina SciGirls program, the Center provides complimentary dinner and transportation each week for the duration of the program. Over the course of each session, the Center’s staff watch as the girls’ confidence in STEM grow. Our staff take pride in their ability to create a warm and safe environment where the girls feel empowered to take risks and share their thinking while exploring STEM. The girls are introduced to female role models that they would not otherwise encounter. Having access to professional Latina mentors who share their own stories of success and failure has proven beneficial to the program. Although the program focuses on STEM, the girls practice working collaboratively, and building relationships among peers and adults — important life skills for every child’s future. We hope the girls take this initial spark and continue their investigations into the world around them, especially as they enter the crucial middle-school years when STEM interest statistically plummets. We believe each girl leaves the program open to new experiences, ideas, and people, with increased confidence and a stronger sense of self. Many of the program’s alumna seek out additional STEM experiences to grow their newfound interest. What started out as a program opportunity has evolved into a passion project. 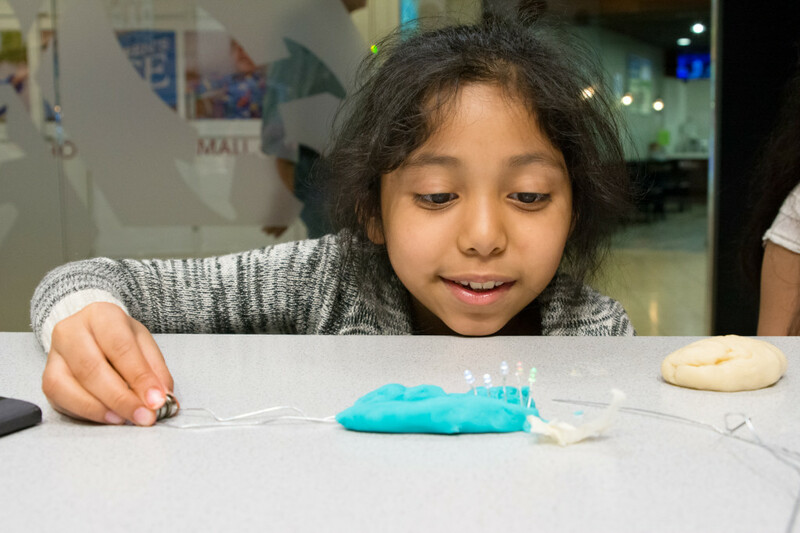 The Children’s Science Center has served over 100 young Latinas since 2016 and is grateful to Twin Cities Public Television, General Motors, and Leidos for their sponsorship. Latinos comprise 17% of Northern Virginia’s population. With this population steadily increasing, the Latina SciGirls program will continue to be in high demand. As the Center moves forward with the capital campaign to build a full-scale science center that will more adequately serve the region’s families, we also look forward to expanding the reach of significant programs like Latina SciGirls. At the core of the Children’s Science Center‘s educational mission is a dedication to meeting the needs of all children, in particular reaching underserved and economically disadvantaged children who traditionally do not have access to private enrichment opportunities. The Center impacts over 70,000 annually with its community programs and the Children’s Science Center Lab. The vision of the Center is to build the region’s first world-class children’s science museum on donated land in Dulles, VA. The Center is grateful for the enthusiastic participation of a community of volunteer mentors, who have come in to lead and facilitate our STEM activities and tell their own stories of success and failure. STEM mentors have included women from NASA, USDA, PBS, FBI, and the Virginia House of Delegates. There are many opportunities through the Center to volunteer and make an impact on our local community. Information can be found here. Did you catch “Online Mentors to Guide Women Into the Sciences” in this weekend’s New York Times? Hundreds of prominent women working in science, technology, engineering and math will become online mentors for college students next month, part of a six-week program to encourage young women to pursue careers in STEM fields. [...] The program has no curriculum, no exam, no grades and no credit — just a goal of connecting young students with accomplished women working in STEM fields. [...] While women now earn more college degrees than men over all, they lag in STEM fields — particularly computer science and engineering, where they earn less than 20 percent of all undergraduate degrees. 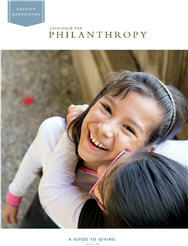 A week ago today, the Nonprofit Roundtable of Greater Washington hosted its 2012 Annual Meeting. As a fairly recent newcomer to the Catalogue, as well as to the DC philanthropic and nonprofit scene, I was to learn about more about the initiatives of the Roundtable and see so many Catalogue nonprofits involved in different capacities. Congratulations to staff from the following Catalogue nonprofits who are participating in the Roundtable’s Future Executive Directors Fellowship program: Mi Casa, City Kids Wilderness Project, Young Playwrights’ Theater, Kid Power, Atlas Service Corps, and Dance Place. The Catalogue would also like to congratulate Tom Raffa, President and Founder of RAFFA, PC, as one of the newest Board members of the Nonprofit Roundtable. Tom also serves as a member of the Catalogue’s Board and is a long-time supporter of the nonprofit sector in the region. Learn more about Catalogue’s nature nonprofits right here. Hope that you had a good (and potentially tasty) “Pi Day” yesterday! According to PiDay.org, “With the use of computers, Pi has been calculated to over 1 trillion digits past the decimal. Pi is an irrational and transcendental number meaning it will continue infinitely without repeating.” As many of us learned in middle school, Pi is the ratio between a circle’s diameter and its circumference and thus can be employed to calculate the area of a circle and volume of a rectangular prism. Pi also makes regular appearances in physics, statistics and probability, and calculus.